From left to right: Louisiana state Rep. Kenneth Havard, Montana state Rep. Frank Garner, Tennessee Senate Speaker Pro Tem Jim Tracy, and Oregon state Rep. Brad Witt. Photo courtesy of Leslie E. Kossoff. 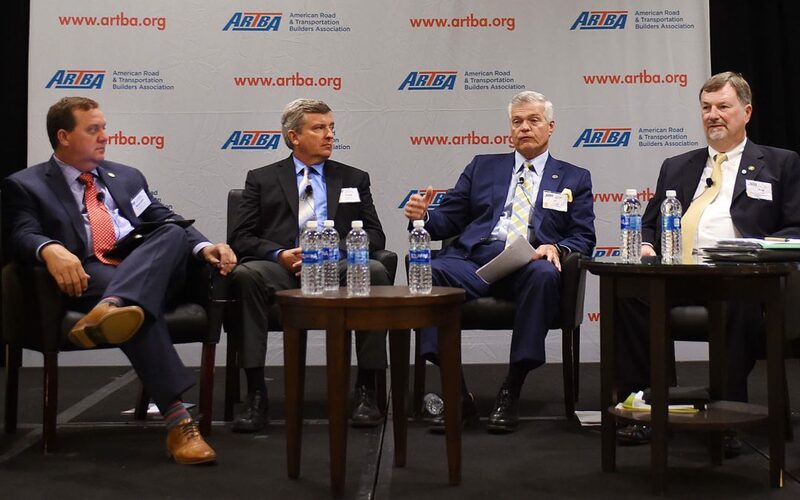 Four state lawmakers discussed legislative strategies and political challenges for funding roads, bridges and other transportation infrastructure during the 4th National Workshop for State & Local Transportation Advocates, hosted July 13 in the Nation’s Capital by ARTBA’s Transportation Investment Advocacy Center. The panel included three Republicans: Tennessee Senate Speaker Pro Tem Jim Tracy, Louisiana state Rep. Kenneth Havard, and Montana state Rep. Frank Garner, and Oregon state Rep. Brad Witt, a Democrat. All four are members of their respective state’s transportation or finance committees. A few themes emerged from the panel discussion moderated by Rich Juliano, managing director of ARTBA’s P3 Division. Building credibility and trust is important. So is educating the public. “Make sure the money goes where you say it’s going,” Havard said. Louisiana faced strong skepticism because two projects promised during a 1989 gas tax increase, the state’s last, had not been completed. “Citizens really don’t trust government,” lamented Tennessee’s Tracy. The challenge is compounded at times by the public’s limited knowledge about how transportation construction is funded, and why it’s important, Tracy said. Anti-tax, outside groups also muddy the debate with misinformation. Witt said Oregon’s DOT conducted 15 town hall meetings to educate taxpayers. Building strong statewide coalitions is also critical. Coalitions should be as broad-based as possible, he said, including non-traditional partners. Witt added that it’s also important to neutralize the opposition. Finally, Tracy suggested a strategy that happens too infrequently in government: finding support across the political aisle.